It's week 4 over at my Picture A Day blog. 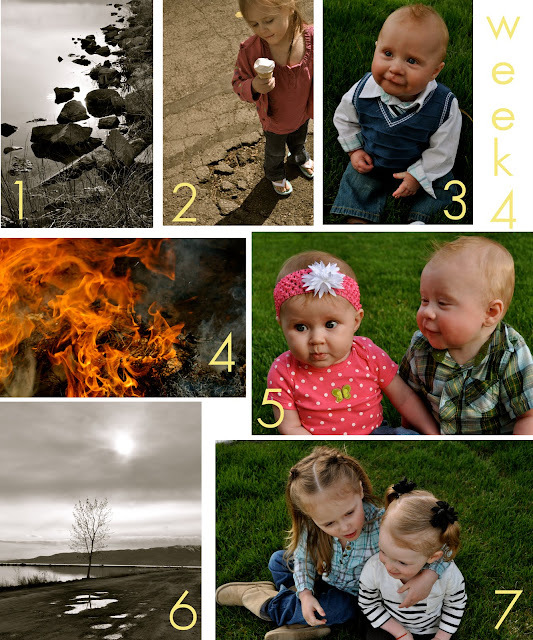 It was a fun week of photos, I had a ton of fun photographing my little ones this past week and I got some fun shots of Utah Lake. To vote, check out the photos here or you can see the full size images over here. The poll is on my sidebar and you can vote for more than one photo! Can't wait to see what you pick this week! I love last weeks' winner. Maybe my interpretation is a tad dark, but to me, it looks like there's a beautiful young woman buried underneath a pile of cliches (can't seem to get the accent aigu on this keyboard) that have been burdened onto her one after the other. I reckon this is not what you had in mind, but this is why I love it! That is a great interpretation! This photo was actually an assignment for my photo class and we had to do a self portrait. It had to be conceptual. I love your interpretation, although that's not what i was going for, but it does make a lot of sense. Thanks for the awesome feedback! Lovely pictures and glad you let us vote...what fun! I need a copy of that girl talk picture! So, so cute. Awesome job!